Abingdon United, Bury and Kent Football United all went top of their respective divisions after results on Sunday 7 April, while Durham Cestria completed a North East League & Cup double. 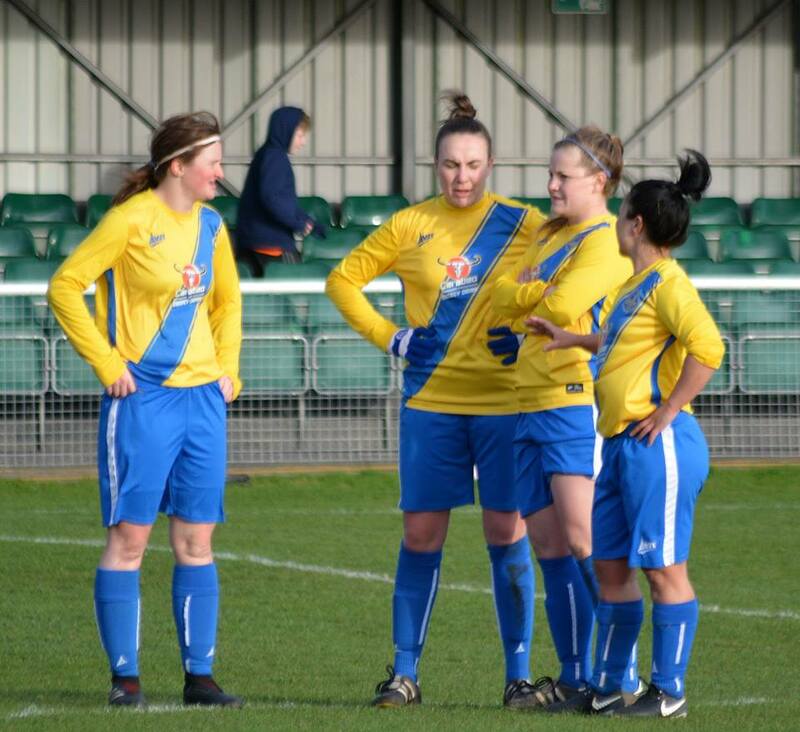 PREMIER – Cambridge City won 3-0 at second-placed Royston Town with two goals by Shannon Shaw. Acle United edged Harlow Town as Mary-Anne Hoy got the only goal, Colney Heath did likewise at Haringey Borough, while Bedford shared four with Wymondham Town. ONE – St Ives Town stayed on course for the title when winning 2-1 at Lawford, Bowers & Pitsea beat third-placed Newmarket Town 3-0 to keep their hopes going. Stevenage Reserves slipped to a 2-1 home reverse to King’s Lynn Town, Histon scored the sole goal at Hertford Town, Hoddesdon Town Owls’ Rosy Wadhams got three in the 5-2 result at Bishops Stortford. 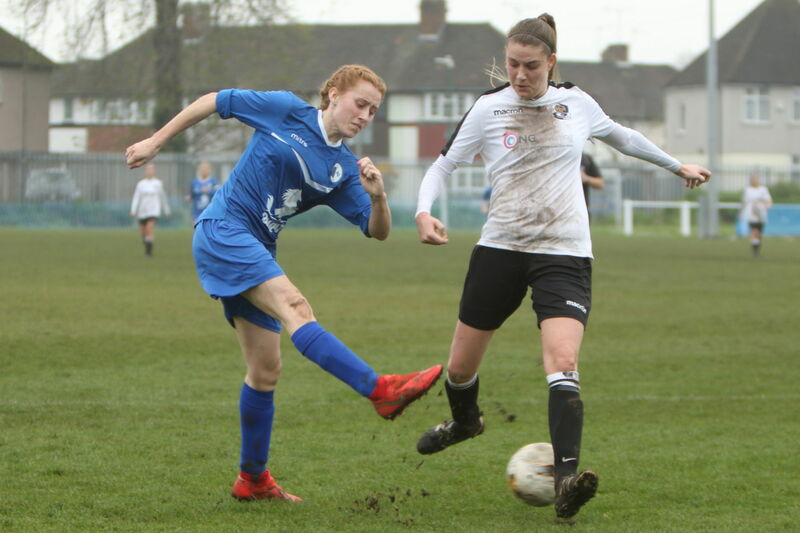 PREMIER – Leicester City WFC Development were 4-1 winners over Kettering Town, Mansfield Town beat Eastwood 4-0, a scoreline matched by Oughtibridge WMSC against Ollerton Town. 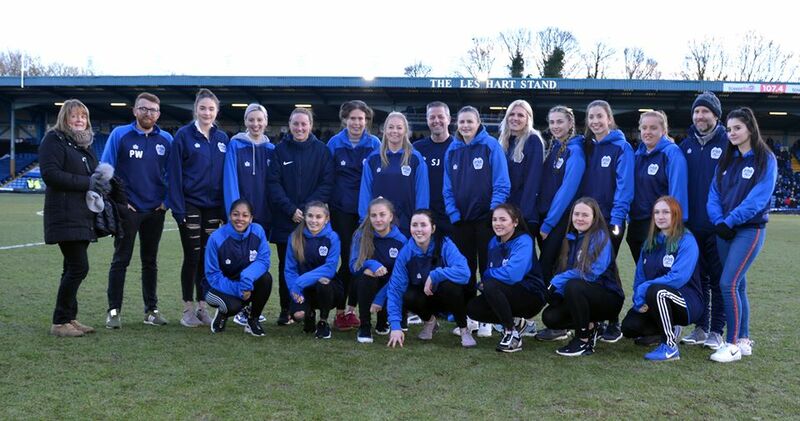 Peterborough United thrashed Leicester City Ladies 17-1 with Hannah Pendred top-scoring with a double hat-trick, while the prolific Jody Scott got all Woodlands’ goals in the 4-2 result with Rise Park. 1 NORTH – Grimsby Borough’s Georgia Silvester got three goals but Lincoln Moorlands-Railway went away with a point from a 4-4 draw, Sleaford Town’s Jessica Machin scored twice in a 2-1 victory at Ilkeston Town and Arnold Town defeated Calverton Miners Welfare 5-3 with the aid of a Maria Wayne double. 1 SOUTH – Northampton Town went clear at the top after their 4-1 win over Corby Town and Oadby & Wigston’s 1-0 home defeat to Notts County, for whom Bella Reed scored. Just one goal in it also at Thrapston Town, where Loughborough Foxes Vixens’ Eva Rogers found the net. PREMIER – Kent Football United were denied the title today in stoppage time after 2-2 draw against near neighbours London KFU (Dartford). Two up at half time through Lizzie Walden and Shannon Burden, they conceded two goals late on to Emily Hart and Verity Snow. KFU now lead by one goal from AFC Phoenix and will be champions if they avoid defeat at home to QPR Girls Development next Sunday. GREATER LONDON JOHN GRENACRE MEMORIAL TROPHY Q/Fs – Division 2 South side Crystal Palace Development pulled off an amazing 6-4 victory over league leaders Ashford Town (Middlesex), in which Aaliyeah Weise-Forbes struck four times. Tooting Bec’s excellent run was ended by Godalming Town, for whom Rebecca Munro netted twice in a 3-1 result. SOUTH EAST COUNTIES PREMIER – Saltdean United leapfrogged Ashford Ladies into second thanks to Naomi Robinson’s 83rd-minute effort. Lewes Foundation gained ground on Worthing with a 3-1 win over them in which Yasmin Church scored twice. Newhaven put eight past Meridian with four from Chloe Winchester. PREMIER – Second-placed Hartlepool United beat Ryton & Crawcrook Albion Tynedale 5-2, Justine Robinson twice on target for them, Farsley Celtic were 3-2 winners over York City. 1 NORTH – Sunderland West End sit second at the completion of their fixtures, which came with a Nicole O’Hara winner against third-placed Consett. Boro Rangers remained ahead of Alnwick Town in mid-table after holding them 2-2 with a Jade Featherstone goal 2 minutes from time. 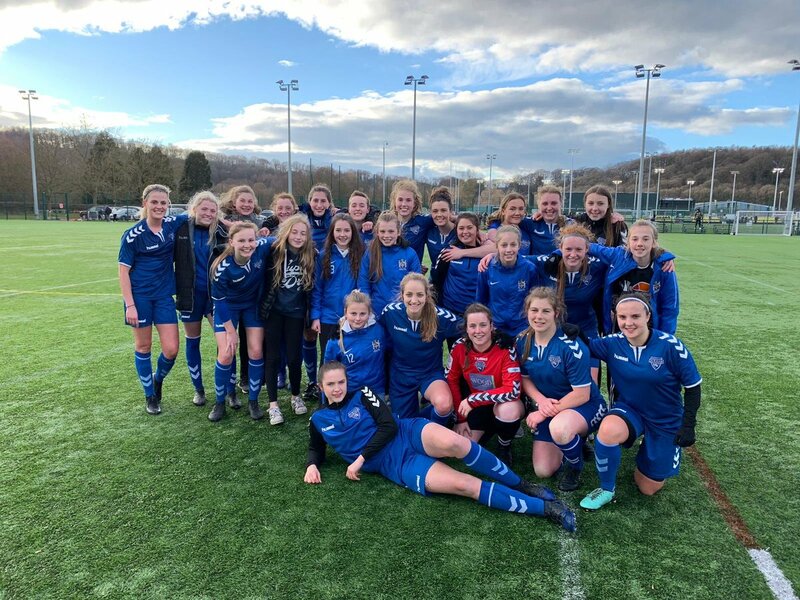 LEAGUE CUP FINAL – Durham Cestria defeated Division 1 South champions Ossett United 4-0, Erin Nelson setting up the success with a brace in the first 30 minutes. PREMIER – Fleetwood Town Wrens went sixth with a 5-1 defeat of Penrith, Sir Tom Finney took the points 4-1 at Accrington. 1 NORTH – Bury went top with 4-0 & 3-1 scores in the double-header with Cammell Laird. Carlisle United netted a dozen at Leigh RMI, Penwortham Town won by the odd goal in five at Morecambe Reserves, while Preston North End pipped Burscough Dynamo 1-0. 1 SOUTH – Warrington Wolverines are on the heels of fourth-placed Altrincham after beating them 3-1, Wythenshawe Amateurs went above Didsbury whom they defeated 5-0 for just a second win of the season. Northwich Vixens hit basement side City of Liverpool 11-1. ARGYLE SPORTS KIT CUP S/Fs – FC United Of Manchester will face Stockport County in the final following respective victories over Merseyrail (3-1) and West Didsbury & Chorlton (4-0). ARGYLE SPORTS KIT PLATE S/F – Blackpool bowed out 3-1 at home to top flight Wigan Athletic, Stockport County Blues join the Latics in the final following a 3-1 extra-time win at Workington Reds. PREMIER – AFC Bournemouth stayed top with all four goals at Oxford City including two from Chloe Tape, Southampton FC Ladies are now just three goals behind with games in hand having netted nine against Ascot United, Emily Wernham bagging a brace within 10 minutes of coming of the bench. Barton Rovers doubled their wins with a 2-1 success over Winchester City Flyers, while Woodley United won 3-2 at Warsash Wasps with all three by Rosie Page-Smith. ONE – Abingdon United are top on goal-difference from Moneyfields and Wycombe Wanderers after Molly Lygo-Jackson and Sadie Timbs got two apiece in an 8-0 scoreline at Shanklin. Eastleigh went fourth with Samantha Hide’s brace against Wokingham & Emmbrook. PREMIER – Exeter City will be crowned champions if they avoid defeat at home to second-placed Keynsham Town Development on Sunday, having won 5-1 at Marine Academy Plymouth with a Sophie Gillies treble, while their rivals defeated Forest Green Rovers 5-0. Portishead had a fine 2-0 result away at Callington Town and and a Dani Harper leveller earned Torquay United a 1-1 tie at Ilminster Town. 1 EASTERN – Top of the table Wootton Bassett Town were held 1-1 at Cheltenham Town Development as Frampton Rangers closed in with a 7-2 success at Oldland Abbotonians, where Abigail Todd scored four times. There were 3-1 wins for Trowbridge Town over Laverstock & Ford and Almondsbury against Swindon Town Development. 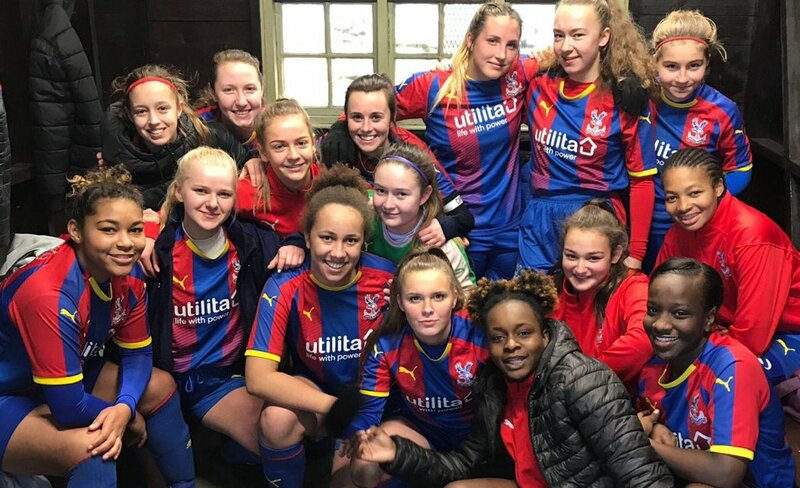 1 WESTERN – Plympton need to win their final match to be runners-up after sharing eight goals at Feniton, where their Dionne Igalawuye got a double. Alphington are on course for fourth spot after a double-figure defeat of Exeter & Tedburn Rangers win which Catherine Wright led the way with four goals. PREMIER – Redditch United scored five at Coventry Sphinx with two in reply, Crusaders got five against Worcester United’s one. Goldenhill Wanderers hit Knowle for six and Stockingford AA Pavilion came away from Lye Town 2-0 victors. 1 NORTH – Stoke City Development put six past Port Vale to go level on points with second-placed Shifnal Town. 1 SOUTH – Solihull United require one point from two games for the championship after defeating Droitwich Spa 5-0. They have scored a record 100 goals in just 16 games and Hayley Wilford also broke all time league top-scoring record by taking her tally to 42. 1 SOUTH CUP S/F – Kidderminster Harriers eased into the divisional cup final when netting nine times against Kingfisher.